Warrior Legend Manga. A fantasy beyond your own! The world is soon about to see a change, a big change! Experience the Legend yourself! Do me a favor! I'm sure you have an Amazon account, please follow me there just click follow under my profile picture and be my number #1 fan! If you are or are to become a Kindle publisher on Amazon then let me tell you a little bit about the benefits of the Amazon Author Central Account. I have now recently opened something called an Amazon Author Account for my manga books and more to come. With this, I can keep better track of my books sales than inside the KDP. On AAA you can get more detailed info about the buyer where the area person is buying from so it becomes easier for you to market yourself later. You can follow me with your Amazon user account by getting the newsfeed from this blog right there instead. There is also a Biography there about me as the creator of a profile picture, which gives a more feeling of trust and you can learn more about the person you're actually purchasing from as well. If you are also planning or already selling books on Amazon then this is something you should have for your books, and for your customers. I believe it's beneficial for people whom bought your book to know more about you as the author and get more in-depth. The Profile also shows up the product page, if you scroll down on the book on Amazon there is a brief biography there as well. 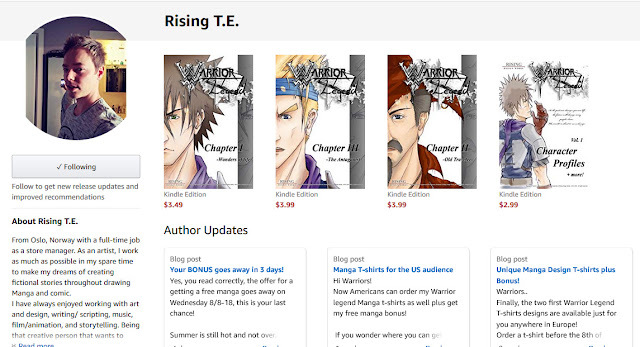 Be sure to check out my profile on Amazon, follow and also check out my manga books in the preview section. If you're not sure yet then be sure to check out my reviews on facebook.com/warriorlegend where I have some review for my books. There are people that are satisfied and enjoyed the story! Now you can be the next to witness the awesomeness of Warrior Legend become a fan today and order Warrior Legend manga now! FREE guide on How to Make Manga! Copyright Ⓒ Warrior Legend and all it works are a trademark of Rising Design Works. Travel theme. Theme images by clintspencer. Powered by Blogger.